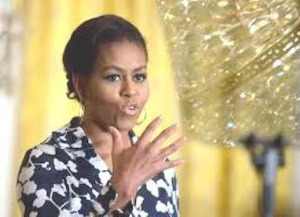 First Lady Michelle Obama announced a new storytelling campaign as part of her Reach Higher Initiative earlier this week. Using the #BetterMakeRoom hashtag, students, educators, administrators, celebrities and other stakeholders took to social media starting Monday to share the stories of their higher education journeys and tips for those hoping one day to be in a position to tell similar stories. “We are all people who believe in you and want to give you everything you have to succeed. That’s one of the reasons we started #BetterMakeRoom,” the First Lady said during the October 19 launch ceremony. “And that’s what #BetterMakeRoom is about,” she continued. “It’s about valuing success in the classroom instead of just on the big screen or on the basketball court. And it’s about turning the culture of celebrity upside down so that we don’t just have kids worshipping celebrities, but we also have celebrities honoring kids who are working hard and achieving their goals. That’s where we’re going to shine the spotlight—on those kids and their stories. Obama teamed up with LeBron James at the University of Akron—with which James’ Family Foundation has a partnership to provide full scholarships for roughly 1,000 Akron Public School students—to promote the initiative October 21. “LeBron might be your hero, but you should all know you’re our heroes, too,” she said at the event. President Obama’s 2020 education goal calls for the United States to again have the highest proportion of college graduates in the world five years from now. But #BetterMakeRoom adds faces and voices to a goal that is often mired in numbers and data. The tweets, posts, YouTube videos and other media are already inspiring many. Stories are being housed at https://bettermakeroom.org/.